There are two main reasons that I can think of why I picked up Perfume. Firstly, the idea of a man who kills in order to preserve the scent of a young virgin is kind of fascinating in a sickening way, and there is a part of me that does relish narratives like that every once in a while. Secondly, I have very little sense of smell myself and I was curious to see what a novel with smell as its primary sense would read like. I guess I wanted to see if it could be conveyed clearly even to someone with my dulled olfactory sense. Perfume: The Story of a Murderer follows Jean-Baptiste Grenouille, an intensely strange and disturbing man throughout his equally disturbing life. From the moment that he is abandoned by his mother to die beneath her fish stall, he is seen as different by those who meet him, though they couldn't necessarily be able to explain why. Whilst growing up, he realises that he has an unusually heightened sense of smell, and he develops a desire to become the world's greatest perfumer and to recreate the particularly exquisite scent of a young virgin girl. And he will do anything in order to possess that scent. 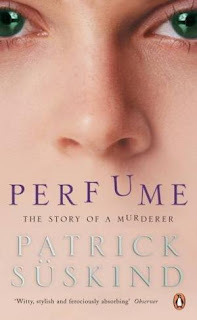 Perfume is an odd book to try and review, because while there is nothing that I can point to within the novel and say that this part is badly written or included unwisely, there is something about the work as a whole that left me a bit cold. I suppose that I can start with what definitely did work, which was the writing itself. It is kind of unusual for me, most of the time I can point at characters, scenes or even themes that endeared me most to the book. But here, it was the style itself that really caught me. In some ways, it reminds me a little of The Child of Pleasure by Gabriele d'Annunzio, because the two have a similar way of enriching their comparatively simple narratives with grandiose sensory accompaniment. Where d'Annunzio focuses on visuals, Suskind brings this world to life through a cavalcade of different scents. I keep trying to think how to describe it and the word lush always seems to come to mind: rich and abundant, if not always (or indeed often) pleasant. It is an enthralling experience to imagine that crush of scents and definitely makes up for some of the lesser elements of the book. I suppose that my main issue is with the main character, Grenouille. Don't misunderstand me, in his own way he is an interesting and well-written character. It was certainly refreshing to have a villain protagonist at least. I suppose my issue with him is that he is more or less a static character. While he creates conflict and has epiphanies about himself throughout the novel, I didn't feel that there was much real change in him at all. At various points in the narrative, he is compared to a tick, parasitic and infinitely patient. Neither of those key personality traits change at all, and considering that his is the perspective that the narrator sticks to for long chunks of the novel it does start to feel a little flat and one-note at times. It's not a huge issue, but I found it noticeable enough to bother me.